Bill Clinton will talk to Senate Democrats on Tuesday, two senior Democratic sources tell CNN. 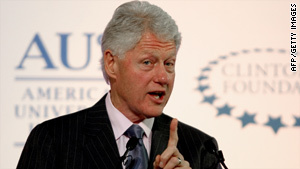 (CNN) -- CNN has learned from two senior Democratic sources that former President Bill Clinton will attend the Senate Democrats' weekly luncheon Tuesday to address the caucus about health care. A notice obtained by CNN went out to Senate Democrats saying, "All Senators should be aware that former President Clinton will be making a presentation on Health Care at tomorrow's caucus lunch. Senator Reid has requested that all Democratic Senators attend." A constant refrain from Democratic leaders is that wavering Democrats must heed what they say is a lesson of the Clinton administration: fail to pass a health care reform bill, and congressional Democrats will suffer on Election Day. With this visit at a critical time for health care in the Senate, the former president will be able to deliver that message in person. Democrats in the House of Representatives approved a health care bill over the weekend. If the Senate passes a bill, a congressional conference committee will need to merge the House and Senate proposals into a consensus version requiring final approval from each chamber before moving to President Obama's desk to be signed into law. The House bill is more expansive -- and hence more expensive -- than the Senate Finance Committee bill. The House bill, projected to guarantee coverage for 96 percent of Americans, will cost more than $1 trillion over the next 10 years, according to the nonpartisan Congressional Budget Office. CNN's Dana Bash, Brianna Keilar,Ted Barrett and Alan Silverleib contributed to this report.